In the summer of 2009 I was in Denmark and met up with Christian Lanng who pitched an idea which solved a huge problem, a problem I had never given any thought at all. In a nutshell the problem he was set out to solve was the fact that governments and large companies receive thousands of invoices every month – in thousands of different formats! Although companies have been doing electronic invoicing for many years – it has been focused around getting invoices produced and internally organized – not receiving them and getting them into the system. So these large entities consequently spend a lot of resources and hence money opening the envelopes, scanning the invoices, OCRing them and manually verifying they are correct – not to speak of the cost of producing invoices including paper, ink, postage and manpower on the other side. In short Tradeshift solves this problem and offers an entire social business network in the process by providing a platform where anyone can sign up for free and start invoicing literally within minutes. Perhaps I should just let Christian Lanng explain the details in the following interview by Robert Scoble during a visit to the US in 2011 attending the Web 2.0 Expo. – and yes the pitch was successful. 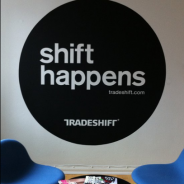 If you are a developer please have a look at developer.tradeshift.com and if you are really into what Tradeshift is all about make sure you keep an eye on the available jobs or just get in touch if you have innovative ideas and skills.